Come with an empty stomach--there's a Franchise Food Park! Get free entry by pre-registering online. Walking in on the day itself not only will take longer, but will also cost Php100. BPI clients can also get free entry by showing their cards during registration. There are dedicated lines for pre-registered guests for faster entry and there are also extra registration counters on the second floor. You can also visit the first-ever Franchise Food Park & Innovation Hub there. With this year’s Franchise Asia Expo being 50 percent bigger and spanning two floors, it’s good to plan out the key booths that you want to visit. The app is available on both Android and iOS. With hundreds of food brands exhibiting, and the first ever Franchise Food Park, visitors to Franchise Asia will be spoilt for choice. Make sure you make room to try the various concepts in the Expo. There are simultaneous seminars happening throughout the three-day expo, where various learning opportunities are available. Business owners can learn How to Franchise Your Business, Why Invest in Indonesia or How to get Halal Certification. Potential franchisees can learn best practices in How to Invest in the Right Franchise. With over 600 brand choices, it’s important to start narrowing it down early on. Try to think of an industry you’re more passionate about—is it food? Retail? Service? Health? Education? In addition, start having an investment range in mind before stepping into the show. Is it a kiosk type franchise (around Php500,000 and below) or larger kiosks and stands (Php500k to Php1.5 million)? Or are you looking for in-line stores (over Php1.5 million) or international brands (over Php10 million)? Franchise Asia offers business opportunities in every industry and every investment level. So you don’t have to continuously fill in forms, bring calling cards with your up-to-date contact details which you can easily give to brands you’d like to hear from. 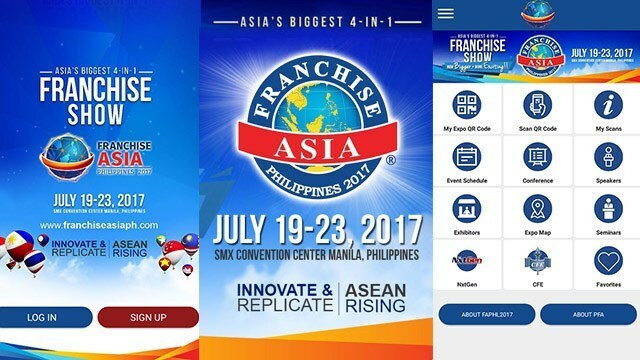 Franchise Asia is a one-stop shop for everything you will need. Aside from franchise opportunities, you have financing partners such as BPI Ka-Negosyo loans, technology partners such as PLDT SME Nation, mall and location partners to help you find the right locations, marketing and media partners to help your business grow and much more. Bonus Tip: Sharpen your business skills by attending the International Franchise Conference (July 19 to 20) before the expo. Whether you’re already a business owner, a would-be franchisee or an MSME just starting out your business, the International Franchise Conference is a unique opportunity to learn from top leaders in the F&B, Retail, Marketing, Digital, HR and Finance industries. With over 50 speakers and 1,000 delegates from over a dozen countries, it’s the perfect venue to learn, to network and to accelerate the growth of your business. Chris Lim is the Chief Marketing Officer of Francorp Philippines (francorp.com.ph); President of U-Franchise Sales & Management (www.ufranchiseasia.com); and Chairperson and Director for Special Projects, ASEAN integration-Philippine Franchise Association.